Warning: This story contains spoilers from the Wednesday, September 19, midseason finale of Suits. Samantha’s on top – ish. During the summer finale of Suits, Alex (Dule Hill) and Samantha (Katherine Heigl) went head-to-head fighting for the title of name partner at Zane Specter Litt. While both pulled every angle possible, she was convinced she deserved the win – and maybe she did. Ultimately, they both got the honor of their names on the wall – something Samantha is not thrilled about. Us Weekly: Now that her name’s on the wall, it’s safe to assume she’s there to stay? Katherine Heigl: Yeah, I think so! I don’t even know if they’re doing a ninth season, but I would assume! Us: The fight between Alex and Samantha really heated up, but we also saw that Alex wasn’t willing to get her disbarred. Is it safe to say they are both willing to go far to win, but they also have a heart? KH: That’s probably my favorite part of the show and Aaron [Korsh]’s storytelling. You definitely have people pushing the envelope across the line, in all types of ways. But when push comes to shove, they do have good hearts and they do have integrity for and with one another. I think they can tell when it’s about to go so far that you can’t ever come back. I think between Alex and Samantha, there’s a lot of mutual respect. They’re being pitted against one another and are both the kind of people who aren’t going to back down and go to the max to win, but when it’s all said and done, I think that that respect is still there. 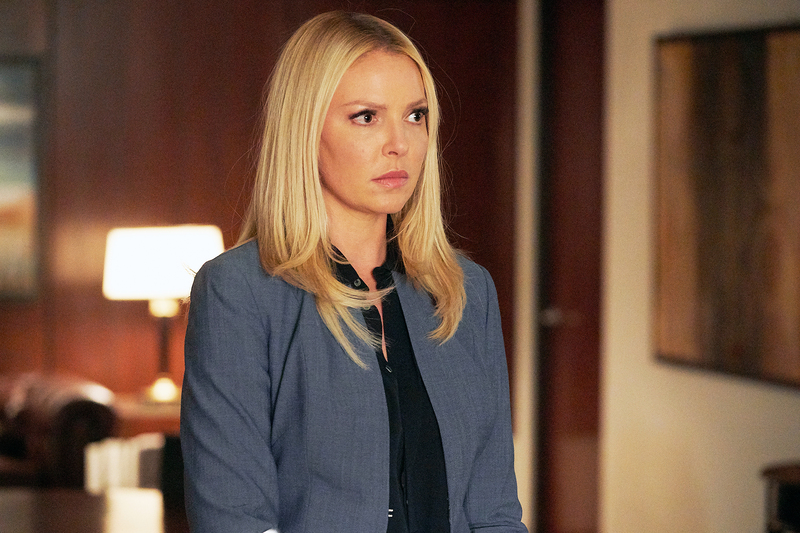 Us: Do you think Samantha’s motivation is more about being right or doing the right thing? KH: It’s being right, for sure. Her motivation, her first gut reaction to everything is, “I must win. I must be right.” But, I think she does have that thoughtfulness to stop and react from a place of integrity when it really matters. I think she’s the type of woman who has clawed her way up to the top. I was just trying to answer this question for myself today. I’m reading a book called Designing Your Life, asking “What is your work philosophy?” I think it’s similar for her and for me. There’s this giant aspect of our work where you feel your most confident, you feel your most self-assured doing something you know how to do and you know how to do well. A huge part of her success is simply that she knows she’s good at this. That confidence perpetuates her continuing to be good at it. She’s really built her self-esteem and confidence around that knowing and so she’s taken it to a level. In order to protect her confidence, her self-esteem, her identity, she must always win. She must always be the best in the room. That’s a very hard thing to do. It really shakes her confidence when she has those missteps or she doesn’t win. Us: Now that her name is on the wall alongside Alex’s, do you think she has an uphill battle ahead of her? KH: Yeah. I’m not entirely sure what Aaron has in mind and what he sees for the rest of this season and if we have another, but I would imagine that despite her respect for Alex and probably gratitude that he was as gracious as he was with this, I think it’s going to be very hard for her to share it. She’s always going to feel like there was no clear-cut winner in the room and that bothers her. It probably would have almost been better for her just to have flat-out lost. This is almost like a participation trophy. That is hard for her. She’s not going to feel like it was properly earned, she’s gonna feel like it was not the victory moment she was looking for and I think she’s gonna start wanting to know how he won, what slick move did he pull? Because he did. Us: We also got a new look at Zane and Samantha’s bond and history. Do you think he ultimately always has Samantha’s back? Does he look at her like a daughter? KH: I like to believe so. I’m playing it, at this point, like they have an unbreakable bond and an untouchable relationship. Every relationship, no matter how great it is, has its ups and downs and frustrations and miscommunications. That will, I’m sure, continue to exist but I think the level of loyalty there is unbreakable. Us: She’s the only female now on the wall. Do you think she has big shoes to fill in terms of how Jessica ran things? KH: I hadn’t even thought of that! I always think of the other guys like women – just a bunch of girls to me! No one can ever touch Jessica Pearson. I miss her on the show a lot. I found her essence and presence and elegance to be so commanding. You could never take your eyes off Jessica. I love that character, I love Gina [Torres] as an actress, no one can touch that. Samantha’s not even close. Us: What do you hope for Samantha going forward? What do you want to see? KH: I’d love to see her develop more personal relationships with people at the firm, beyond Alex even. We’re starting see her develop that relationship with Donna, which I love. I’d also love to see her personal life a little more. I always find that kind of interesting. Alex and Zane are the only two who are married and have families. These are all people who are in their late ’30s early ‘40s. Have they ever been married before? Have they been divorced? Do they have children floating around? We know Harvey and Donna don’t have children but what about Samantha? What’s her story? I’d love to find that out. In terms of being a lawyer, I want to see what it’s going to look like for her to have her name on the wall. What does that mean to her? Does she feel like one of four or is she going to try to step into the Jessica Pearson role? Is she going to try to fight to be the first name on the wall? Is that going to be her next brass ring to reach for? Us: We got some cursing this season! Has that been fun for you, since it was never allowed on network TV? KH: It has been because it feels more grown up. I don’t really mind a lack of language but I do mind it when they are trying put it in and you can’t say the actual word so instead you’re left with “What the freak are you talking about?” or “What the heck do you know?” Adults don’t speak like that! So for me, it’s either nothing or everything. Let’s not go there at all or let’s totally go for it. It’s been really nice to be on a show where the circumstance arrives and the absolutely only word that is appropriate is the F-word. It feels good.